All was well and bright in the sky city known as Cloudsdale. Until a young flight school class took cooking. Powders and liquids flew across the room as the teacher continued to yell at the students to sit down. Both giggles and playful threats were exchanged by the young pegasi. Every-pony was involved in the large cooking fight. Every-pony but one. The brown and white colt sat in the only clean corner of the room, stirring a strange concoction. As the battle grew to it's breaking point the small pegasus in the corner has accomplished his goal. He had made chocolate. Dipping his hoof in the brown substance he licked it as to taste it. The flavor seeped onto his tongue sending the young pony into nirvana. Something caught him off guard. It needs a tiny bit more sugar. While he was off in his own world, around him ponies chuckled as the fight came to an end and they made up. Suddenly as the colt in the corner added a pinch of sugar, a large explosion from the corner made every-pony scream. Not only had the chocolate exploded in the brown pegasus' face but it happened to hit every other flyer in the room. Every-pony was silent. A loud laugh could be heard from a faceless figure. Moments later a little filly was licking her face in curiosity. Not only was it the best flyer in Flight School but it happened to be the only pony known to perform a Sonic Rainboom. "Wow! A chocolate explosion! It tastes awesome!" the rainbow pegasus chirped. Soon enough every-pony was chanting "chocolate explosion". The colt's face reddened with embarrassment. Not only were they praising him for his mistake, they were actually liking it. "My name... My name is Chocolate Explosion." he spoke loud and clear. Never before had he felt so proud. So welcome. "That's awesome! Oh, you already have your cutie mark? Have you always made chocolate?" Rainbow asked, staring at his flank. His gaze followed hers, now staring in awe at the beautiful image tattooed to his backside. Though simple, it was gorgeous. It was his. "No... this was my first time..." he admitted, still looking at the sparkling bowl of chocolate on his back limb. He simply smiled. Chocolate Explosion came into the world in a ball of fire, though unharmed. He collapsed in front of one of the Wonderblots' house. They took him around, searching for his parents but could not find them. They tried to raise him by themselves, but work kept them from properly raising the strange pegasus. Though challenging, they gave him up to the school to raise. He was always considered an outcast for not having parents and living at the school. When he earned his cutie mark he was finally accepted into the world. His attitude change dramatically for the better. He graduated as second top of the class, next to Rainbow Dash (his best friend). 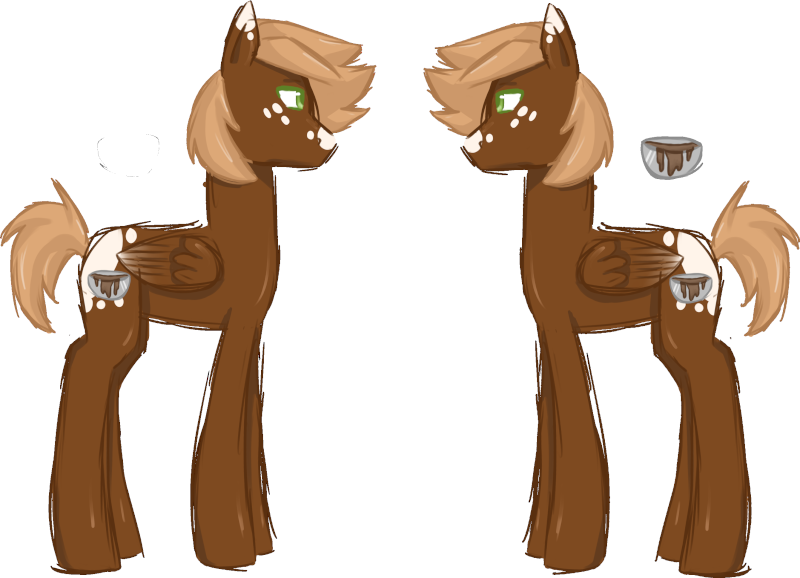 He soon moved down to Ponyville where he now makes chocolate for Sugarcube Corner. He lives a peaceful life, spending as much time as possible with his friends to make up for years without any.